Using ordinary spools of thread, Sperber creates pixilated, inverted images of masterpieces, which appear as colorful abstractions to the naked eye. When viewed with optical devices, however, the works becomes immediately recognizable as the famous paintings. The thread spools works are hung upside down in reference to the fact that the lens of the eye projects an inverted image of the world onto the retina, which is corrected by the brain. A clear acrylic sphere, positioned in front of each work, functions like the human eye and brain, not only inverting but also focusing the image so that it appears as a sharp, faithful, right-side-up reproduction of the famous painting. 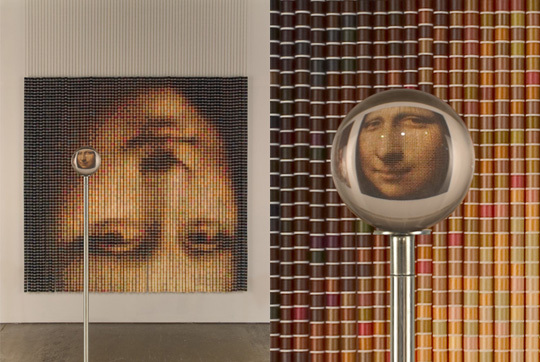 Devorah Sperber represented the Brooklyn Museum and the United States with three thread spool installations based on Leonardo da Vinci's The Last Supper and Mona Lisa. Her concept was based on the technology of print making and how mechanical reproductions alter images and the scale of artworks as they exist in “the mind’s eye”. She selected The Last Supper and Mona Lisa because they are two of the most recognizable and reproduced images in the history of art. 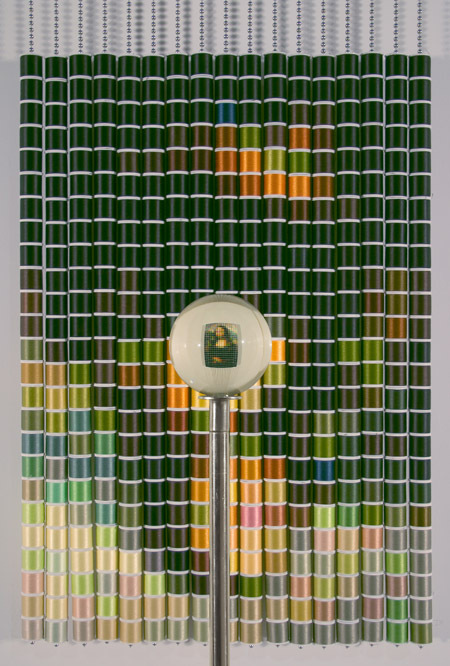 This exhibition will travel to: Brooklyn Museum (2007), MASS MoCA (2008) and the Boise Art Museum (2008). Additional Sites T.B.A. Through the use of digital technology, scale, and optical devices, these 3D "reproductions of reproductions" reintroduce aspects of the original works of art which are absent in most reproductions such as: the effects of monocular vision, scale, resolution, and spatial frequencies on vision. My intent is to reintroduce these dynamic aspects into the mind's eye of viewers. Premise: When works of art are mass-reproduced through prints, posters, postcards, books, and the internet, the reproductions can easily replace the original artworks in the mind's eye. These imagined images can lack important aspects of the original works such as context, scale (even when accompanied by dimensions), the intended relationship of the viewer to the work, and the work to site. The Mona Lisa and The Last Supper are prime examples of the disparity that can exist between original works of art and the images seen in the mind's eye. The numbers of people who have seen these paintings in person are relatively few when compared to the vast numbers of people who have seen reproductions or "reproductions of reproductions." I suspect most people are surprised when they see the original works in person and experience the relatively small scale of the Mona Lisa (30 x 20 7/8"), the subtle effects of Mona Lisa's elusive smile, The Last Supper's relatively large scale (15' x 29'), the 3D illusion of the mural as an extension of the site, and the current restored condition . 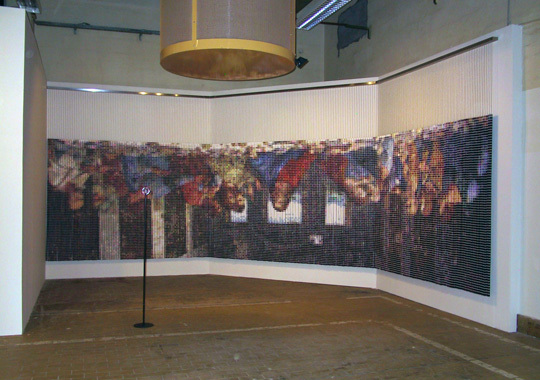 Description: a life sized (29' w) rendering of Leonardo da Vinci's The Last Supper constructed from 20,736 spools of thread.. When seen with the aid of optical devices, the spools of thread coalesce into realistic images of Christ and his disciples.. 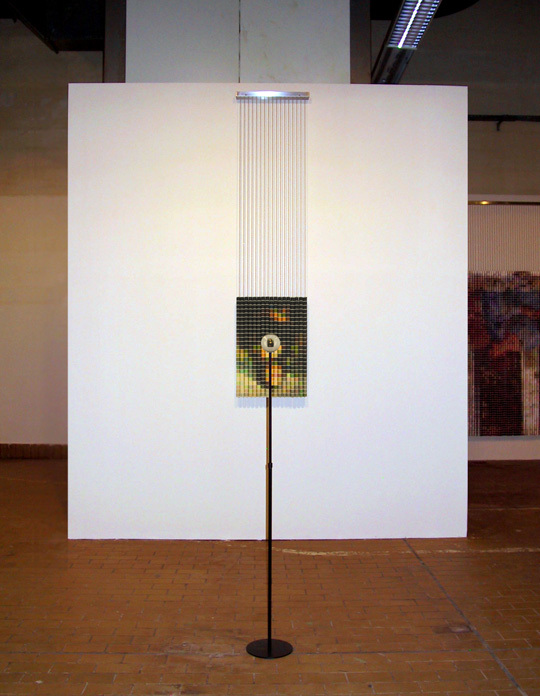 The thread spool columns are strung onto aluminum ball chain and hang from an open ended, symmetrical trapezoid-shaped hanging apparatus. Like the original mural, the Christ figure's right eye is centered and serves as the single vanishing point. The two 45 degree angles of the trapezoid reference the site-specific nature of the original mural (the illusion of being an extension of the interior architecture). 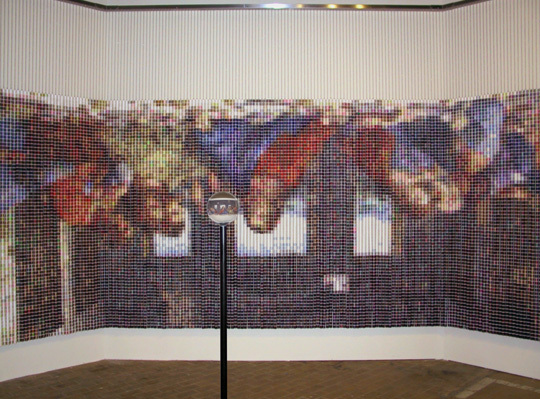 When seen with the naked eye, the spools of thread appear as an abstract arrangement of multi-colored blocks/3D pixels, further abstracted by the fact that The Last Supper imagery is upside down and backwards. 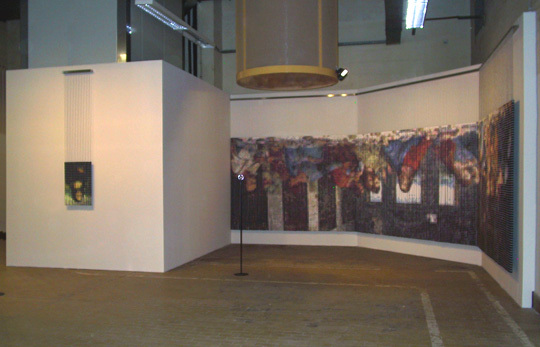 The clear acrylic viewing spheres rotate the imagery 180 degrees back to the correct orientation and condense the individual pixels/spools of thread into recognizable images. In addition, each sphere offers a different monocular view of the work, accentuating the illusion of 3 dimension as it exists in flat paintings. Leonardo da Vinci understood that the illusion of 3D in paintings was derived from monocular, not binocular, vision. The original mural is highly symmetrical, with the right eye of the Christ figure as the single, centered vanishing point, from which all compositional elements project. In my rendering, the vanishing point, also Christ's right eye is slightly lower than eye level. Because the spheres rotate the imagery 180 degrees, viewers have the illusion of looking up at the image, replicating the orientation of viewers to the original mural. Description: a life-sized rendering of Leonardo da Vinci's Mona Lisa. 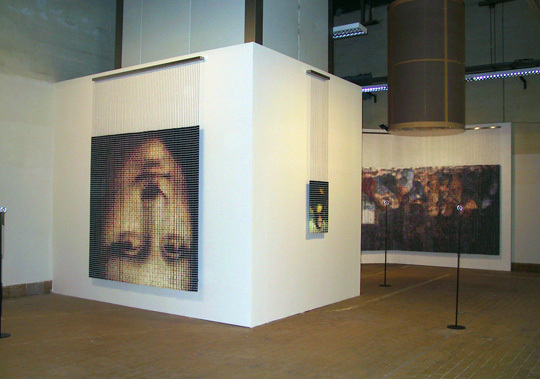 The work is constructed from only 425 spools of thread resulting in extremely low image resolution. Yet when seen with an optical device, the thread spools condense into a blurred yet recognizable image, conveying how little information the brain needs to make sense of visual imagery. This concept was explored by self-described "Cyberneticist," Leon Harmon of Bell Labs in 1973. His early pixilated image was included in an article for Scientific American in November 1973, titled "The Recognition of Faces" as a demonstration of the minimum conditions needed to recognize a face. Description: an enlarged rendering of The Mona Lisa's face. 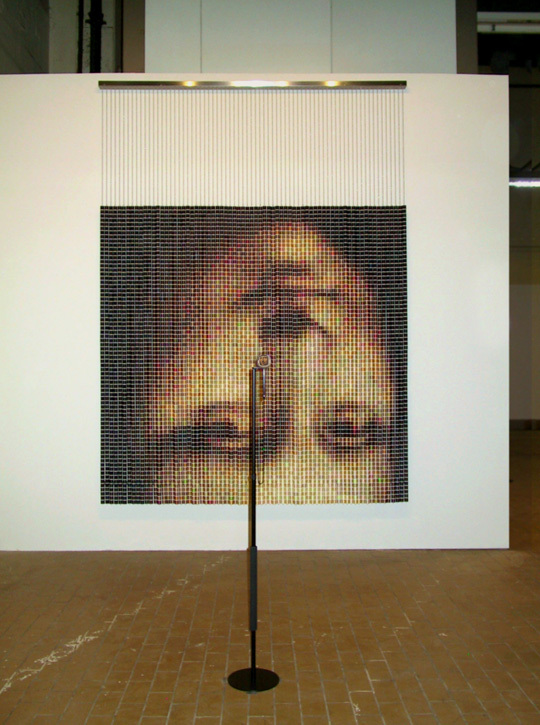 When seen with the aid of several viewing spheres, distorted views of The Mona Lisa's elusive smile mimic "low spatial frequencies" usually seen only with peripheral vision. Unlike the original painting, in which her smile is only visible with peripheral vision, in my rendition The Mona Lisa's smile appears, morphs, and disappears in a dramatic and humorous fashion.